At Ocean Coast Electric, our warehouse electricians have the special set of skills your enterprise needs. While all forms of electrical and technical engineering come with their own unique skill set, the repertoire of abilities necessary for warehouses and factories is often in a league of its own. Generally, warehouses contain a host of sophisticated machinery and electrical systems; the smooth operation of which is vital to productivity. A single technical glitch can cost thousands of dollars in lost time, even if it only lasts a few hours. Further, the machines in question often can involve highly sensitive and costly components, with a wide range of systems from micro-currents to high voltage components that require considerable expertise. Given what can be at stake, your business needs a warehouse electrician that you can rely on. 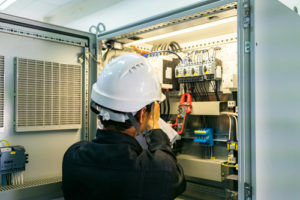 Ocean Coast Electric proudly serves the communities in and nearby Somerset County and Middlesex County, New Jersey, with a team of seasoned warehouse electricians who will complete the job correctly the first time. ● Emergency Services. Our team provides both general emergency services, as well as installation and maintenance for emergency lighting. ● 120/240 or 277/480 Volt Systems. We’re experienced with high voltage systems, such as the 277/480 volt that is standard in most industrial facilities. ● Explosion Proof Wiring. A must-have in any potentially hazardous factory or warehouse space. ● Code Violation Inspections. Our team is qualified to identify any potential violations in your facility, helping you avoid a fine. ● Generators. Generators can experience all kinds of technical issues, from faulty belts to clogged fuel tanks. If your facility is having problems, let our expert warehouse electricians take a look. ● Load Calculations & Evaluations. In many warehouses, it is essential to accurately calculate the necessary size for your furnace or air conditioning unit, as specific temperature conditions are often needed to properly maintain the goods being stored and shipped. Our experts will evaluate your facility to determine precisely what sort of HVAC units you need. Ocean Coast Electric proudly serves the communities in and near Somerset County and Middlesex County, New Jersey. Besides serving warehouses and other industrial facilities, Ocean Coast Electric also works with private enterprises in commercial electrical installation and commercial lighting replacement services. Are you interested in learning more about what Ocean Coast Electric can do for your facility or commercial residence? Contact us today by calling (732) 338-8732 or by emailing us at office@oceancoastelectric.com.